Once finished the river descent Roma Rafting ® offers you a refreshing surprise! On 1 May, as every year, the last leg of the International Descent of the Tiber arrives in Rome, event involving many fans, among the canoeists, cyclists and trekkers, even from abroad. Spend May 1st differently, with your friends, making a nice rafting descent with us, along with many other canoeists! 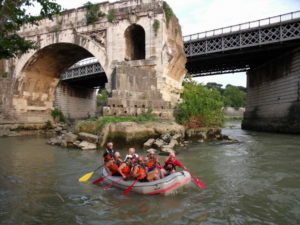 Starting from Ara Pacis to Ponte Marconi (c/o Polisportiva Ostiense), passing through the rapids of the Tiber Island. The promotional price of 15 € per person in this guided descent includes the use of the life jacket, a helmet and paddle. Minimum age: 8 years old. Call now to book: places are limited! A rafting descent in the heart of Rome on the Tiber river for a different New Year! It starts from Ponte Milvio at 11.00 PM. EVENT – The spectacular Festa della Girandola, seen from the Tiber! An evening rafting descent, starting from Ponte Milvio at sunset. Along the way, with the spectacular backdrop of Castel S. Angelo, we will attend to the fireworks display of Girandola, then continue on the river along the many stalls on the roadside, up to face the rapids of the Isola Tiberina, to land soon after Ponte Palatino.